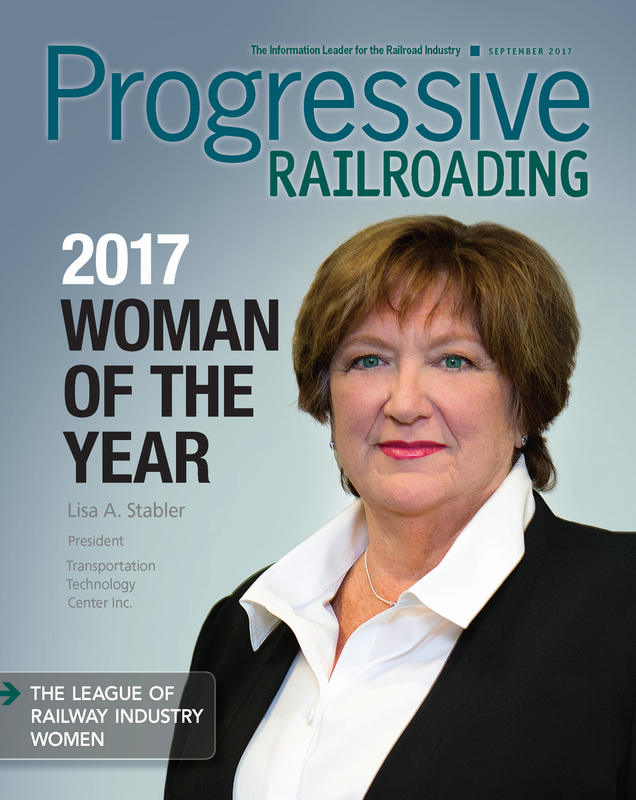 Indianapolis, IN, September 18, 2017 – The League of Railway Industry Women (LRIW) named Transportation Technology Center, Inc. (TTCI) President Lisa Stabler as the winner of the 2017 Outstanding Woman of the Year award. Stabler was honored at the General Session of Railway Interchange. Lisa Stabler's contributions to the industry in her role as President of the Transportation Technology Center, Inc. in Pueblo, Colorado, have impacted railroading across the U.S. and the globe. Under her command, the world's premier research and testing facility continues to advance the science of railroading and improve operational safety and efficiency. Stabler became president of TTCI in 2011, after joining the organization in 2010 as vice president, operations and training. She previously was assistant vice president, quality and engineering for BNSF Railway, where she improved quality, advanced research and streamlined processes using the Six Sigma problem-solving method. Earlier in her career, Stabler held key roles at General Motor's Delphi Corporation in the areas of product engineering, quality assurance, and strategic planning. She earned her bachelor of Mechanical Engineering at the University of Dayton and holds a masters' degree of Science in Mathematics from Wright State University. Stabler has received recent media attention for her expertise; she was featured in a July 2017 Today Show segment on train safety, demonstrating TTCI's groundbreaking research into rail wheel defect detection. Past LRIW Outstanding Woman of the Year winners have included Metro-North Railroad's Anamaria Bonilla, Metrolinx's Mary Proc, Alaska Railroad Corp.'s Wendy Lindskoog, and Norfolk Southern Corp.'s Deb Butler. A call for nominations for the 2018 LRIW Outstanding Woman of the Year award will open in the spring of 2018. Founded in 1997, the League of Railway Industry Women is dedicated to providing leadership and support for the personal and professional development of women at every level in their railroading careers and railway-related business endeavors. Its mission is to create a forum within the rail industry that provides women with the opportunity to achieve a broader understanding of the railroad business. Learn more at www.railwaywomen.org. For further information: Media Contact: Emilia Marceta, LRIW Chair, Public Relations & Outreach, Phone: 416-526-0156; E-Mail: info@railwaywomen.org; Awards Contact: Lisa Tackach, LRIW Awards Chair, E-Mail: awards@railwaywomen.org. Check out the October 2017 issue of Progressive Railroading.